The School of Social Work is a proud Peace Corps partner school and honored to house the Paul D. Coverdell Fellows Program. The Coverdell Fellows Program allows returning Peace Corps volunteers to pursue subsidized masters and doctoral degrees. At Monmouth, Coverdell Fellows pursue their Master of Social Work (MSW) and have a choice between two concentrations: Clinical Practice with Families and Children (CPFC) or International and Community Development (ICD). 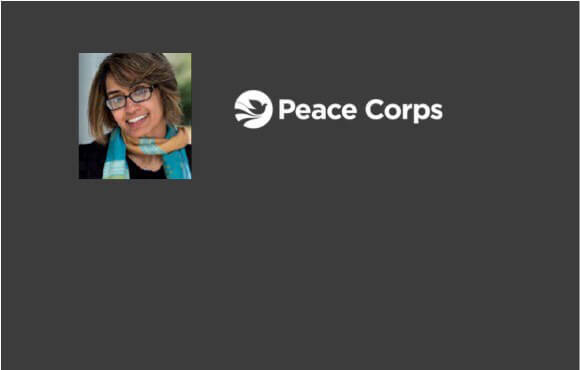 If you have returned from the Peace Corps our MSW program is an ideal fit for you and will give you the opportunity to share and expand upon the skills you learned as a Volunteer. As a Fellow, in addition to class work towards your degree, you’ll complete an MSW internship focused on assisting underserved individuals, families, and/or communities locally and beyond. ICD students have the option of completing an 8-to-10 week internship at an overseas placement (past placements have included Vietnam, Chile, Bangladesh, and Costa Rica). 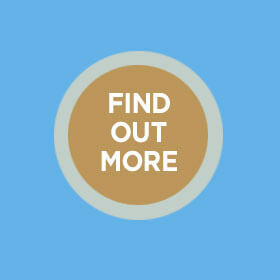 To learn more about internships visit our Fieldwork page. Fellows will be awarded either a Resident Assistantship (which will cover room and board) or a Graduate Assistantship (which will provide 6 credit hours tuition remission). All returned Peace Corps Volunteers (RPCVs) who satisfactorily complete their service have lifetime eligibility for the Coverdell Fellows program. In addition, returned Peace Corps Response (PCR) Volunteers and Global Heath Service Partnership (GHSP) Volunteers who serve a full 12 months are eligible (this can come through one 12-month tour or a combination of shorter tours). 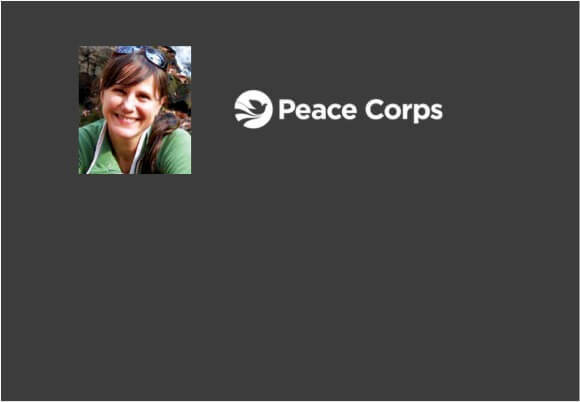 Mary Szacik served as a Youth and Community Development Volunteer in St Vincent & the Grenadines from 2005-2007. Mary sought out masters programs that could help her strengthen her ability to confront economic and social injustice, which ultimately led her to Monmouth University’s Master of Social Work International and Community Development program. Her internship took her to the ports of New Jersey fighting for labor rights alongside port truck drivers, and as a result she was hired as a full-time community organizer in Newark, where for several years she fought in partnership with homeowners to save their homes from predatory foreclosures. Now Mary works as a therapist with children and their families in rural New York. Brandon Green served as a Non-Formal Education volunteer in Burkina Faso from 2011-2012. Brandon chose Monmouth University to pursue his MSW for its focus on human rights and social justice, its International Community Development track, as well as its Peace Corps Fellows Program. 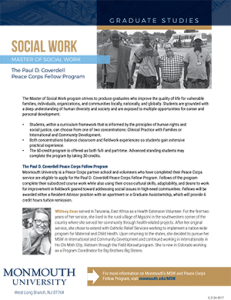 He believes that social work is rooted in social justice and human rights and that these issues are relevant throughout the diverse profession. Upon graduation Brandon is looking forward to taking what Monmouth University and his Peace Corps experience have taught him and begin his career as a social worker in the Charlotte, NC area. Sharda Jetwani served as a Children, Youth and Families Program volunteer in Costa Rica from 2003-2005. Sharda chose to seek an MSW at Monmouth University because of the program's focus on human rights through both global and local perspectives. After completing the International Community Development track, she worked for different organizations, eventually landing at Lunch Break in Red Bank, a soup kitchen that works to alleviate hunger and lead its clients to self-sufficiency and healthier lifestyles. As Program Director, she oversees all programming, food pantry sign ups and clothing operations, in addition to supervising interns. Tom Sunchuk served as a Youth Development volunteer in the Philippines. Tom chose to go to Monmouth University because of their Peace Corps Fellows Program as well as their international field work opportunities. While getting his MSW at Monmouth, he was able to do field work in Da Nang, Vietnam with East Meets West Foundation. 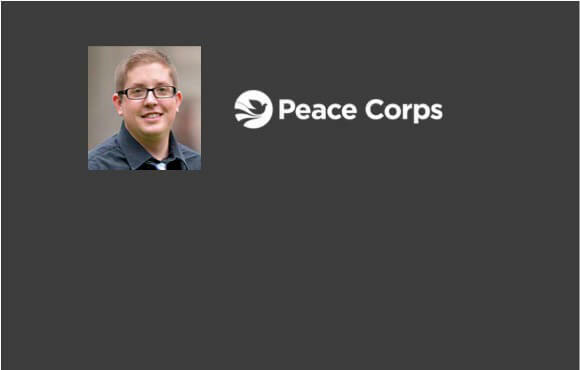 After graduating he served as a Peace Corps Response volunteer in Suriname. He works as a Program Manager for City Year in Jacksonville, FL. Tom says that his Monmouth education provided him "with the skills to look at the world with a constant lens of social justice and human rights." Whitney Dean served in Tanzania, East Africa as a Health Extension Volunteer. For the first two years of her service, she lived in the rural village of Mgazini in the southwestern corner of the country where she served her community through health related projects. After her original service, she chose to extend with Catholic Relief Services working to implement a nation-wide program for Maternal and Child Health. Upon returning to the states, she decided to pursue her MSW in International and Community Development and continued working in internationally in Ho Chi Minh City, Vietnam through the Field Abroad program. 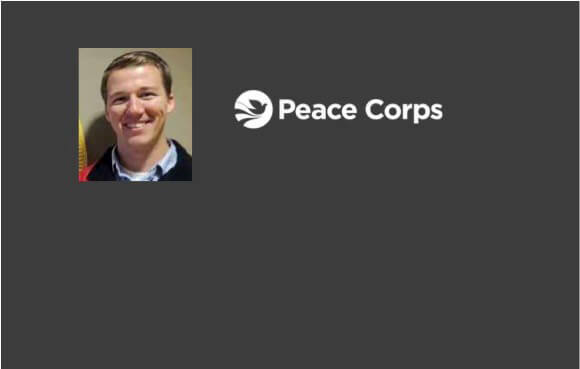 We are thrilled to partner with the Peace Corps in the Fellows program. We enjoy having the returning Peace Corps volunteers in the Monmouth community as graduate students in our Master of Social Work program. Their experience will benefit the classroom as well as the community where their Peace Corps experience will definitely be put to use in their field internships. Peace Corps Fellow Resident Assistants will receive room and board. Training for this position will be provided by the Office of Residential Life before and during each semester. As a Resident Assistant, you are required to respond to residents’ needs and ensure that Monmouth University’s rules and regulations are being upheld. You are also expected to develop and assist in programming in the residence halls. Programming is designed to build community and foster diversity and educational, social, and emotional growth. Peace Corps Fellow Graduate Assistants will receive 6 credits of remitted tuition, as well as a stipend. As a Graduate Assistant, your responsibilities within the School of Social Work will be determined based on the skills and expertise you developed during your Peace Corps experience. 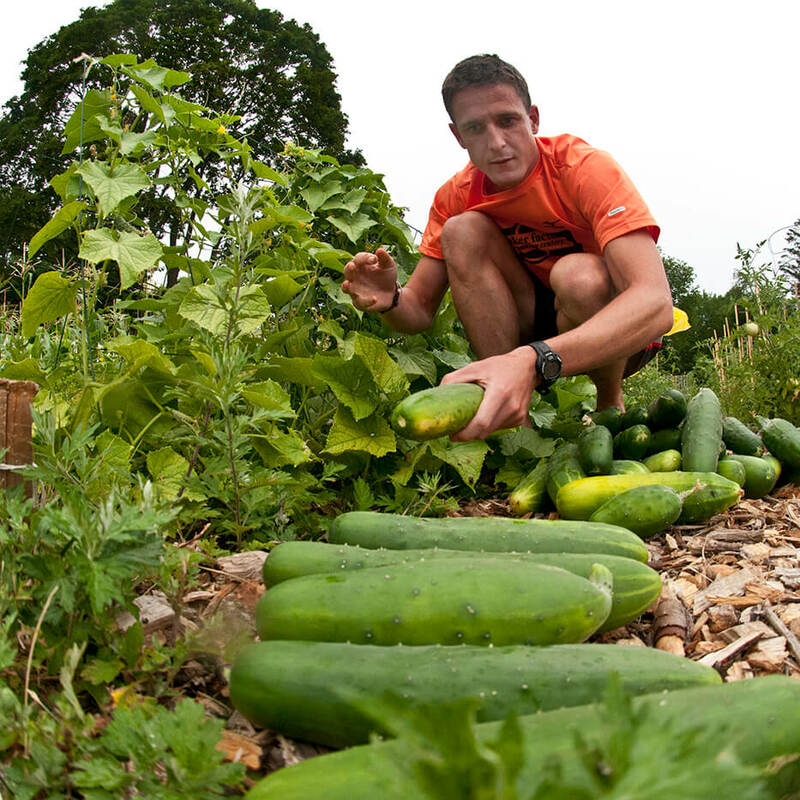 They can vary from working in the school’s community garden to developing and managing content for its website. Graduate Assistantships are renewed on a semester by semester basis provided you maintain an eligible graduate GPA of 3.0 or better. The first step to pursing your MSW at Monmouth as a Peace Corps Fellow is simple: Apply to the MSW program at Monmouth. You must do this before anything else. The application can be completed online. All applicants must provide transcripts, an essay, and three letters of recommendation. The applications are read on a rolling basis beginning in January and continuing until the program is full. The applications are read by a faculty Admissions committee and interviews are requested if faculty have questions about the application. 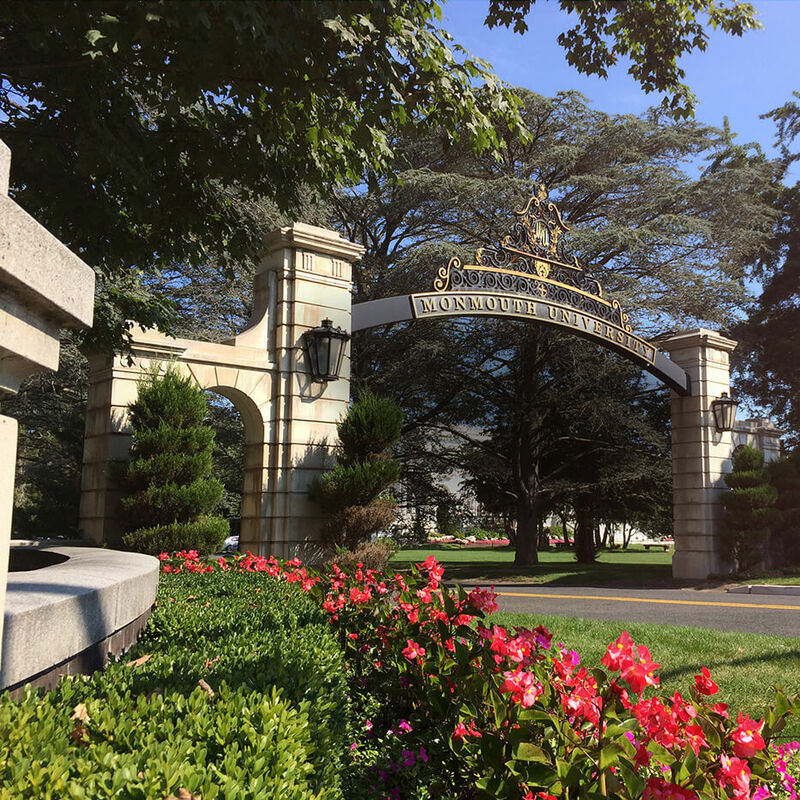 For more information on applying to the MSW program please see the Monmouth University Graduate Admissions homepage. Once your MSW application is complete, you must apply for a Graduate Assistantship before May 1 in order to be considered for the Peace Corps Fellows program. Graduate Assistantship applications can be found here. You must make a deposit to Monmouth University before you can be offered a Graduate Assistantship. 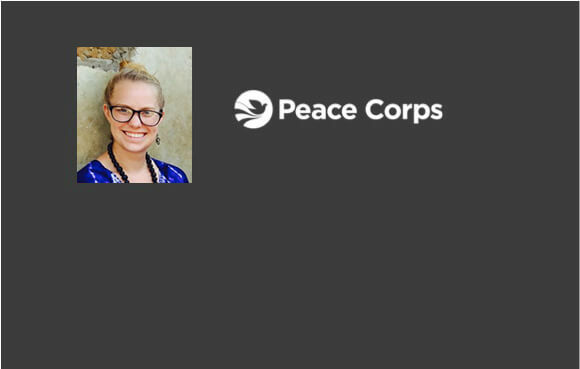 Peace Corps Fellow applicants are also required to have an interview as their acceptance equals an appointment for an assistantship. The interview will include representatives from the faculty, field staff, and Residential Life staff. All parties must agree that the applicant is appropriate for the program and the Residential Life Program Assistantship in order for the applicant to be offered the Peace Corps Fellows position. At this time, the Peace Corps Fellows Program at Monmouth University is only open to single adults as campus housing cannot accommodate families. For more information about Peace Corps Fellows, please visit the Peace Corps Web site at www.peacecorps.gov/fellows. For questions about the MSW Program and Peace Corps Fellows at Monmouth University please contact Robin Mama, Dean of the School of Social Work, at rmama@monmouth.edu.